So the Twins have traded Johan Santana to the New York Mets. Fine. Whatever. It’s not as if we’re not used to seeing superstars leave Minnesota. We’ll always have memories of Johan pitching that deciding game in the World Series… oh wait, no we won’t. But that’s the perspective we need to have if we’re to persist as sports fans in the frozen tundra. We win it all when lightning strikes and the stars align, not by actually being better than other teams. 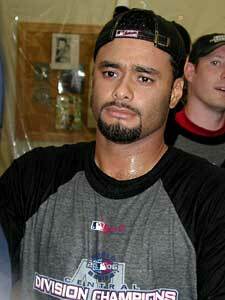 Johan Santana, afterall, was a gift. He was a Rule V draftee. His previous team didn’t want him and it’s safe to say the Twins, who were horrible, picked him up because he came cheap. He spent two years on the roster and, let’s face it, his name could’ve just as easily been Bombo Rivera for all we cared. Through luck, they ended up with a two-time Cy Young Award winner. So can we really complain that somehow we’re jinxed by fate now? But enough about what we think. Let’s see what the folks in New York have to say. The Yankees and Red Sox offers must really have petered out in the end, because the Mets’ package here is nothing the team will really miss in the short run and none of the people you would have rated most highly in the long run: Carlos Gomez, Phil Humber, and pitchers Deolis Guerra and Kevin Mulvey, rated by minor league guru John Sickels as the #2, 3, 4 & 7 prospects in the Mets system. No Wright or Reyes, no Pelfrey, no Fernando Martinez (the #1 prospect). Obviously, no Milledge. Not even Dan Norman. Looks like highway robbery to me. Although the Mets sacrificed four key members of their farm system in the deal, they also managed to make the trade without giving up prized prospect Fernando Martinez. I don’t think you can let Twins general manager Bill Smith off the hook here. While it seems the Yankees and Red Sox weren’t willing to deliver an acceptable package at this late date, I suspect that the Yankees’ interest—and by extension Boston’s—waned when potential replacement options in center field (guys like Torii Hunter or Mike Cameron) and in the back end of the rotation started to go off the market. In the abstract it makes sense for a high payroll team like the Yankees to concentrate as much value as possible into as few roster spots as possible (roster spots being more scarce than money), in practice they would have needed to replace the rumored major league talent heading to the Twins for the move to make sense. Smith should have known that the deeper it got into the offseason, the less a deal would make sense to the Yankees. The window to close a deal was clearly earlier in the offseason, and while Smith did a good job of drumming up interest, he didn’t close. Instead, he clearly overplayed his hand here and got burned. He deserves some credit for cutting his losses and taking the best package possible, but his tenure as GM is not off to a promising start. They could not get the Mets to include outfielders Ryan Church or Fernando Martinez, which would have sweetened the deal quite a bit. It seems the Twins are taking a lot less than, say, Lester, Coco Crisp, infielder Jed Lowrie and pitcher Justin Masterson, which was one offer from the Red Sox. For the record, Church is a 30 year old mediocore player. Crisp is a nobody with the coolest name in baseball. And how shortsighted would it have been to trade Santana to a team in the American League anyway? All is not lost. The Twins weren’t going to win anything this year anyway. And if you haven’t heard of the new players, well, had you heard of Johan Santana before 2000? Look, Santana is a good pitcher, but he’s also 29 years old and for three straight years, opponents have hit him better than the year before. There was at least the possibility that on opening day in 2010 in the new stadium, Santana would no longer be the lights-out, best in baseball starting pitcher. He’d just be paid like one. Twins fans, come in off the ledge and move on. No crying, but sure seems to be lots of whining..